Hang gliding is probably the simplest type of flying there is. 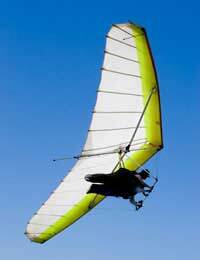 The hang glider has a rigid aluminium frame shaped like a large wing and is covered by rip-stop nylon or Mylar. The pilot usually flies in a prone position suspended from a strap attached to the gliders frame. He controls the hang glider by moving from side-to-side and backward and forward on the strap, altering the centre of gravity of the hang glider. You need to be reasonably fit and active to fly a hang glider, have good co-ordination, and be able to think clearly under pressure. You don't have to undergo a medical to fly a hang glider, but should be in good health. If you suffer from high blood pressure, diabetes, fainting, or a heart condition, you should ask your doctor's advice before flying. Hang gliding has always been considered a dangerous sport, but technological advances in equipment mean the sport is safer now than it has ever been. All new gliders now come with built-in stall recovery systems and are designed and tested to be as sturdy and stable as possible. Like any other form of aviation pilot training and safety is of paramount importance. New pilots should be trained by a certified instructor who will guide the novice on landing, take- off and flying techniques before they take to the air. Pilots carry a parachute with them in the harness as a back-up. If a pilot gets into serious difficulties he will deploy the parachute which is thrown by hand and it will carry him and the glider back down to earth safely. Even after deploying the parachute, pilots are still advised to climb back into their control frame as the frame will absorb some of the impact. Broken limbs and sprains can still happen when a parachute has been used, especially if the hang glider was flying at a relatively low altitude. Many hang gliding clubs hold parachute deployment practice on the ground to master the technique in case of emergency. As well as carrying a parachute pilots also wear a helmet and usually carry other safety equipment. Hook knives are carried to cut themselves free from the parachute harness after landing or for cutting their straps in case they land in water or up a tree.Radios used to call for help; light ropes for lowering themselves from trees and a first aid kit are normally carried during a flight. Pilots should wear a helmet, a pair of leather gloves (to stop the hands from slipping on the control bar). A few layers of light but warm clothing with a windproof or lightweight waterproof jacket are better than one or two heavy jumpers. Wearing waterproof overalls or a one piece ski suit on top is even better. Your footwear needs to keep you dry, walking boots, or jump boots without lacing hooks that could snag your lines are ideal. In summertime trainers with ankle supports are commonly worn. Whatever type of footwear you choose they should be comfortable and easy to walk in. If you have to land in an emergency you may have to walk some distance to find help.